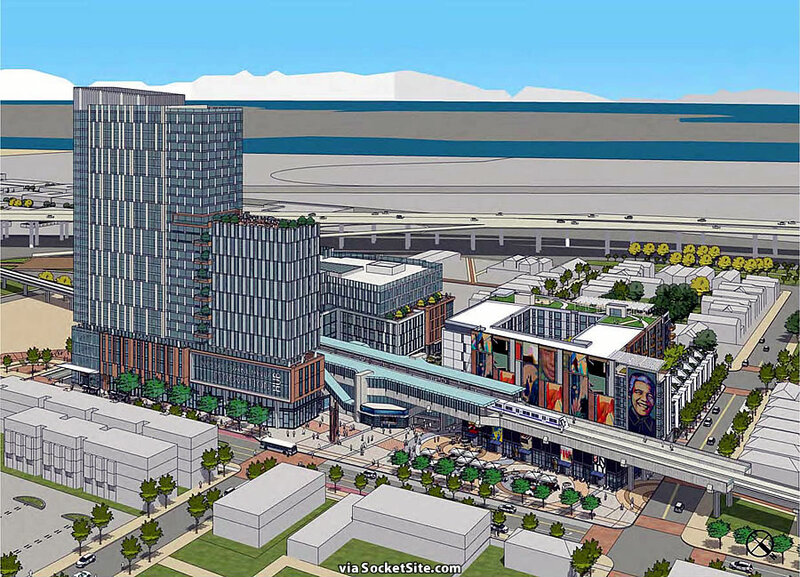 As proposed, nearly 800 residential units could be built at the base of the West Oakland BART station, with a 30-story, 500-unit residential building rising up to 320 feet in height at the corner of 7th and Mandela, a 7-story mid-rise building with 240 below market rate units (and 22 market-rate duplexes fronting Chester), and a 100-foot-tall office building at the corner of Mandela and 5th. 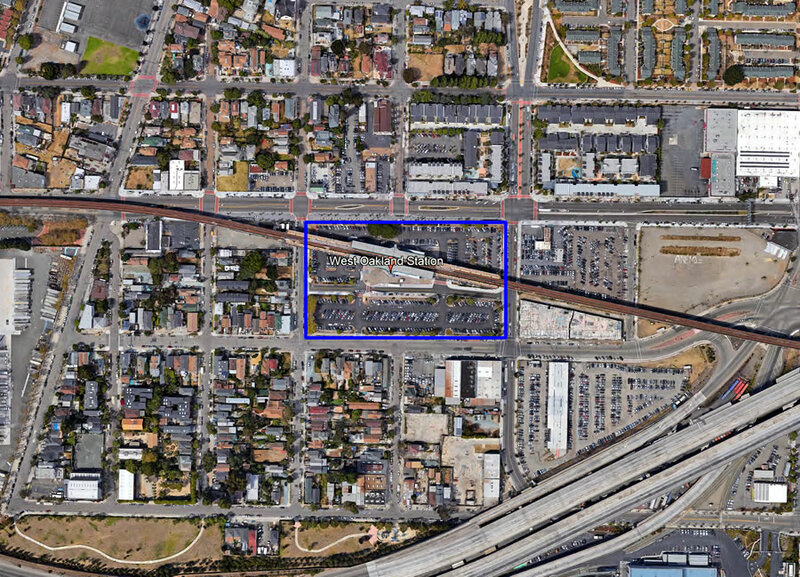 While the station’s current surface parking lot for 451 cars would be eliminated to make way for the development, a new underground lot below the development would provide parking for 400 cars and a public bike station (with secured storage, rental and repair facilities) under the overhead BART tracks would accommodate around 500 bikes. 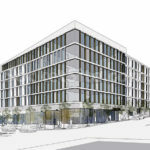 And while the proposed project is officially “in the design phase” and “no details are as‐yet available regarding the construction schedule and phasing,” according to the project team’s internal development schedule, they’re aiming to secure approvals and financing by the end of this year, break ground on the first phase of the overlapping, three-phase project in early 2020, and complete the West Oakland Station development in the third quarter of 2022. Very cool, though timing seems incredibly optimistic. I’m betting on 2028. Crazy how there are also three other huge open plots / parking lots to the East of this project that could be even bigger. So much transit-oriented infill opportunity in the Bay. “Crazy” in the sense of crazy-sad, as one of them SHOULD be even bigger right now. Looks great but I feel like I’ve seen many different proposals for this site. Why don’t we get any proposals that involve burying BART? It would obviously improve the livability of this neighborhood. You might be thinking of another big development, one short block away, to the east. 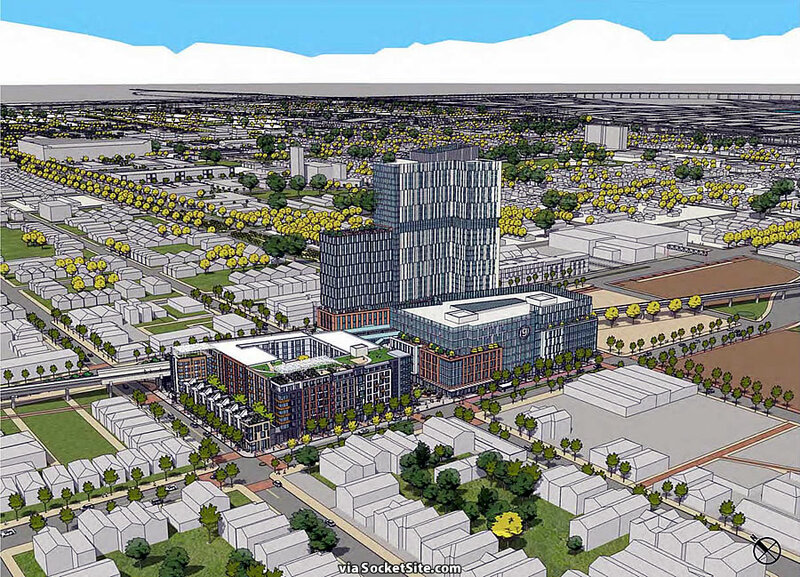 Actually I was thinking of the West Oakland BART Station Transit-Oriented Development (TOD). Undergrounding BART is extremely expensive so I really don’t see the point. It’s not that hard to walk under the elevated rail… Who would pay for that? Isn’t the money better spend on making housing affordable? Everyone for miles around has to listen to the screech of the train, and it deposits fine steel dust in the air to give your kids asthma. Also birds stand on it and poop on people. Finally it would greatly benefit this station’s numerous riders if they have a covered platform in the rainy season. There is a reason BART is underground in Berkeley. I believe it has the same provision that all outdoor stations do: the 4-car “core” is covered and the rest isn’t. The reason that BART is underground in Berkeley, of course, is b/c they paid to have it so, and it wasn’t placed there afterward, it was built that way. not quite the same thing. The reason BART is underground in Berkeley is because Berkeley paid to put it underground. 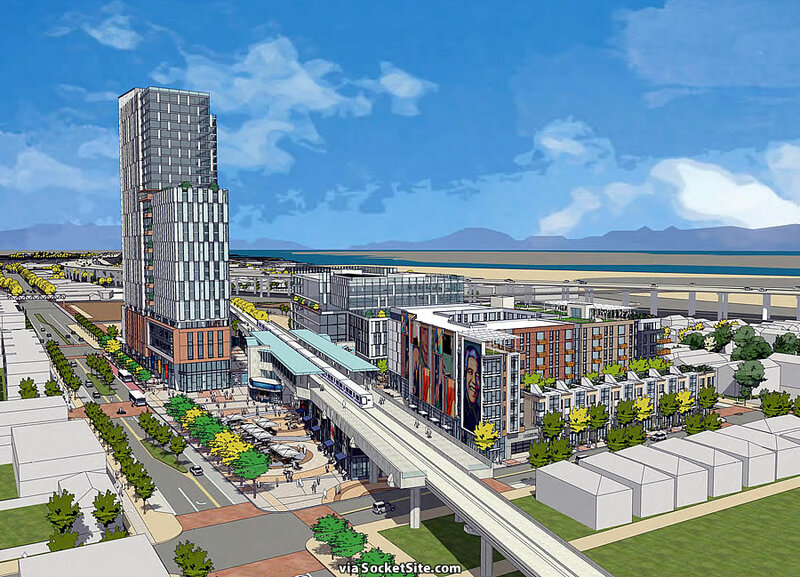 At any rate, it would be better for west Oakland to underground 980. The BART tracks are relatively unobtrusive by comparison. The exhaust from the port and highways in the area are literally many orders of magnitude worse than the impacts BART has on the area. ditto everyone else. Undergrounding BART post construction would be insanely expensive. Yes, it keeps coming up from the community, but we’re not talking about a few million bucks….we’re talking hundreds of millions, minimum. That ship done sailed. Berkeley was so smart. Just goes to show you that the affluent NIMBYs on the Peninsula don’t have a monopoly on hyper-unrealistic dreams of undergrounding existing rail lines. You’d think they’d at least enclose it and “bring it indoors” like they do at SFO. A “tunnel” in the air would reduce noise so much for the tenants. Old cars are getting quieter wheel profile. New cars already have quieter wheels. Once all old cars are gone, BART plans to regrind the track to make it even quieter. All this will happen faster and cheaper than any proposal to bury BART could go before planning. Like others said, burying 880 would be a better investment. I don’t mean bury it. I mean build the building podium around it. I’m glad to hear (or not hear) they’re quieter. I’d still enclose them, if nothing else to create an open terrace level for the housing. Is the 400 parking spaces for the existing BART as well as all this additional development 750+ residences, 450k sq of office and retail? Seems woefully inadequate given the existing demand. No. 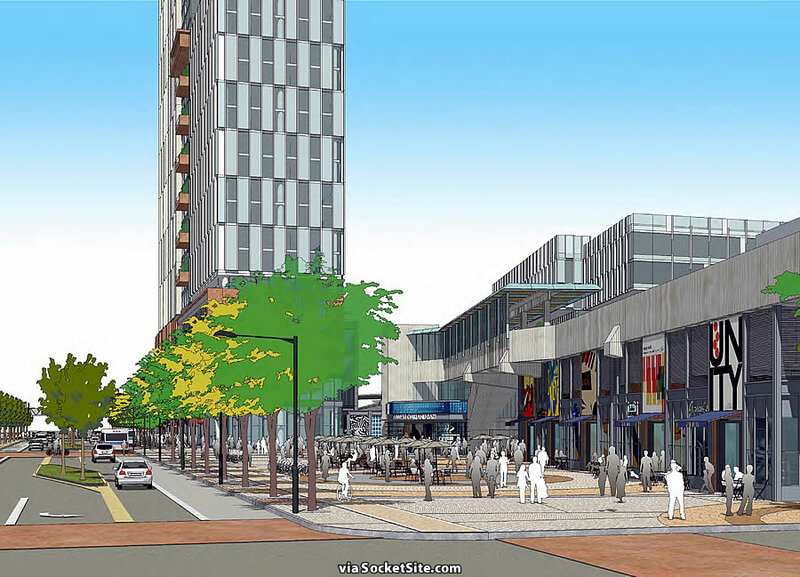 While the new garage is “planned to provide adequate parking for the residential, commercial and retail uses on site,” the design is also “planned to encourage pedestrian and bike access to the BART station” (i.e., the dedicated BART parking would not be replaced). That seems crazy to me. Don’t we want people taking BART across the Bay instead of driving? We want people not using cars as a last mile solution. What about using a car for the last two miles? Let’s say that someone lives two miles from this station and works in San Francisco. Are they supposed to take a bus to the station? Are they supposed to walk? Both of those options are significantly slower than driving. At some point it’s quicker to just drive over the bridge. Isn’t that what we want to prevent more than anything? if you live 2 miles from this particular station, this is probably not the closest station to you. Then what if you live one mile? 1.5 miles? Isn’t it still better to drive to the BART station than drive across the bridge? This station has 8000 daily boardings and only 400 parking spaces. 95% of riders are already not driving. Would there be a problem if this station had 600 parking spots and 8200 daily boardings? Would that not be an improvement if it kept 200 cars off the bridge per day? Yes, you answered it yourself. Yes, they should walk or take a bus to the station. In the ideal world, but in the real world, people will just drive. How much time might it add to someone’s commute to take the bus to BART? Another 20 minutes each way? 30 minutes? If faced with the prospect of adding another 30-60 minutes to their commute every day, away from their kids, are people more likely to drive? Which is the better choice: to drive a couple of miles to the nearest BART station or to drive across the bridge? As a dedicated transit rider, I do not know the answer to this question, but how is driving from one’s home in Oakland into downtown San Francisco any quicker than taking a bus+BART? Not being snarky, but unless you are going between 10:30 AM and 2:30 PM is the Bay Bridge not a parking lot? Also, what happens once you get off the bridge? If one does not have dedicated parking, how long does it take to find a spot? And going back home in the evening are downtown streets not gridlocked? In conclusion, unless one has a dedicated parking spot and travels off-peak, how is driving from Oakland into San Francisco faster than transit, not to mention being a supremely stressful and unpleasant experience? It’s also slow to drive across the bridge. But you have the convenience of leaving directly from your home and leaving work immediately when you want instead of waiting for the next train. Or maybe there are people who come to SF at 10 am when the bridge is more empty but the BART parking lot is full. I’m just arguing that we should do everything we can to encourage people to take BART instead of driving across the bridge. We should make it as easy for BART riders as possible. I’m not sure if this is done, but doing a study of the origin address of every car and time of arrival in the parking lot might provide some insights of new shuttle routes, bike-share stations, new bus routes or even possible carpool options. Most drivers there either pay big money for a parking permit or “get lucky” by waking up early, and would likely appreciate not risking their car to break-ins every day. answering Martin, BART’s survey’s (every several years) plot trip origins by mode of travel for each station, and the results are presented graphically. It’s all very interesting. Yes. You take the bus. What is the problem? I take the bus to BART every day. Good for you! That’s not a solution for everyone. We still want to make it as easy as possible for people to take BART under the Bay as opposed to driving over it. Love it! …but I do need to point out that the current surface parking lot is already reasonably level. The echo of the trains as it bounces of the buildings on each side is going to be … well really, really loud. For the lower level units facing the station if will probably be near as loud as being in an underground station. This looks like Opportunity Zone territory so 0% capital gains if they hold it for 10 years. Hope Bart got their money’s worth because this was prime dirt even without the tax incentive. I mean, I would love for this to be built. But realistically, so much has to go right. Funding, BART, keeping BART functional while they build, parking elimination, China…. MacArthur redevelopment happened pre-AB 2923, pre-elimination of parking minimums, pre-elimination of vehicle centric LOS and prior to Oakland’s median home sale price exceeding $700,000 This. Project. Has. Legs. But that was not like, ON TOP OF the bart station. I hope it happens! It would be game changing. I live in west oakland. But seems like a loot of hoops to jump through. Both involve the redevelopment of parking lots. Neither project is actually on top of their respective station… except those pesky life sucking shadows. Again, there are fewer hoops at West Oakland than there were at MacArthur. 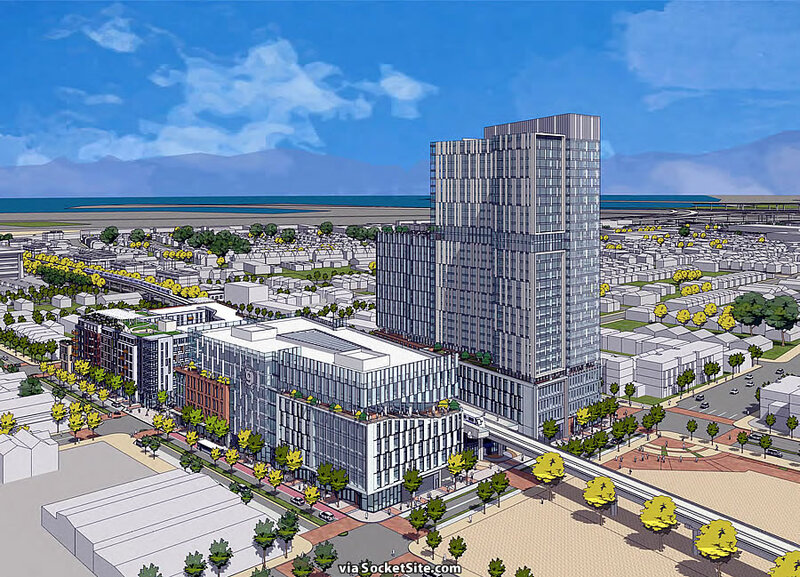 West Oak NIMBY’s have fewer options to challenge this plan than the MacArthur NIMBY’s had and… well… there’s a 25-story high rise going up at MacArthur just as close as the proposed WO tower. I won’t be complacent, but I highly doubt WO NIMBY’s will have any teeth to stop this. I wonder how BART is going to accommodate all the new passengers from all these transit developments? It’s already at capacity during rush hour commutes. It’s funny — we have criticisms of “how BART is going to accommodate all the new passengers” and also “eliminating parking is going to make people drive instead of taking BART”. I do think “how’s BART going to accommodate more passengers” is a more realistic concern. And the answer is better management, and investment– in new trains, improved tech, major construction at the downtown SF stations that are currently the bottleneck. And, hopefully, that investment can be at least partially funded by these development projects, which is a model that has been successfully used in other cities around the world. I take BART everyday from Oakland to Millbrae. Two comments. Before 630am the trains are busy but you can maybe find a seat, sometimes. Plus by the time you pass Montgomery 3/4 of the people are off and most of the others get off at Civic Center. It’s short stretch of about 5 stops through downtown Oakland to downtown SF that are at crush load. With respect to office space in the east bay. I can’t be more baffled either. Huge development at Bishop Ranch with PGE and Chevron and no serious public transportation options. Then working on the Peninsula I see what Foster City and San Mateo have built up for office space (lots of infill taboot) and it’s silly that San Leandro or Hayward couldn’t do the same…and they have much better transportation options. Hell, bulldoze the Hayward Airport or the Southland Mall or even Bay Fair mall and put in quality office space. 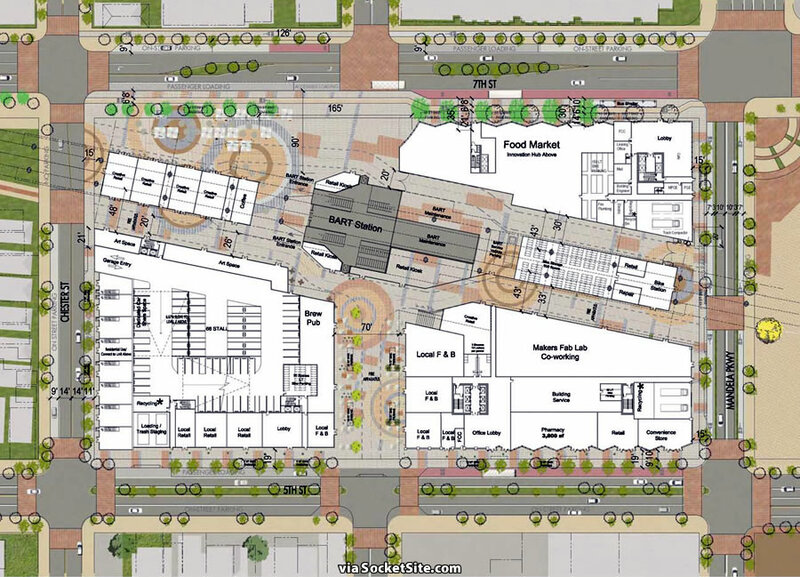 Bay Fair Mall has very substantial redevelopment plans in the works. This “how is BART going to accommodate more passengers” question is so SF-centric. 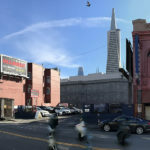 Has anyone given any thought that they just may be heading in the other direction to a booming downtown Oakland office market? Remember, 12th Street/City Center is just one stop away. There’s plenty of capacity in the current counter commute direction. The majority of office development from this point on will be in Oakland, not in already congested downtown SF. Are you seriously claiming that the majority of all office development in the Bay Area will be in Oakland? Because that is outrageously delusional. Not to mention there’s plenty of capacity in both directions, not just counter-commute (which by your line of “reasoning” isn’t actually even counter-commute). Why would that be delusional? The plan is for an additional 17 million sqft of office space in Oakland within the next 10 years. The vast majority of the population lives in the East Bay. There are 2.7 million residents in the East Bay compared to 870,000 in SF. Makes much more sense for our region to place the majority of new office space in downtown Oakland. yes, it’s delusional, but it is nonetheless a good point that there is tons of capacity between WO BART and downtown Oakland, and there is in fact a growing office market in DTO. So that is real. And as others have pointed out, a standing trip from WO to DTSF is not that big a deal. Also, BART has tried to market West Oakland for office….but I would say that there’s still plenty of room in downtown Oakland and that’s where the majority of the market is going to be for the conceivable future. The whole concept of “backoffice” space is pretty dead (AlamedaRenter above). Or, rather, it’s in India. I can’t think of a use off-hand that would locate in West Oakland. So they already have the capacity to run 23 trains per hour? And they only want to increase the actual number of trains per hour from 16 to 20 (4 lines, from a 15 minute frequency to 12 minutes)? They can do that today, and then increase it to a train every 8 minutes per line once the signaling upgrade is done. My understanding is that there is at least one more bottleneck: the number of people who can get on and off the platforms at Embarcadero and Montgomery. If people can’t get off fast enough, you can’t close the doors. I suppose they could try hiring Japanese-style pushers, but I doubt that would work. They do have a plan to add additional platforms on the outsides of the tracks, so that the trains can open the doors on both sides simultaneously. Last I heard that would cost another billion or two (especially considering that you’d pretty much have to keep the station open during construction!) Though the three doors on the new cars will no doubt help. MacArthur BART redevelopment was the dress rehearsal for this and the only negatives have been how stupid BART has detoured riders to get in and out of the station -they treat us like the very last priority :- With all the new laws passed since MacArthur -you can only call this proposal is a slam dunk. If I was a nearby resident I might feel differently, however from a rider’s perspective it’s nice to be above ground and on an elevated structure and able to enjoy the views. This is a, misplaced, reply to Jeffrey Baker’s call to underground BART in this area. If they build this there won’t be anything to see from the platform. Had BART ever considered leasing the land to the developer under a decades-long lease? Rather than sell the land and lose control of the development process, BART could instead lease the land for 30, 50 or even 99 years. BART could receive a nice cash flow, and also retake the property for future improvements (quadruple tracking, larger buildings, new station, &c.) without the challenge of buying back the parcel at a premium. Hopefully this won’t burn to the ground before it’s finished the way so many buildings do in Oakland. Love this (imperfect) plan. Put it into high gear.